Search Our Web Directory for a Professional Junk Car Removal Company Located Near You and Get Free Towing! Finding a local auto salvage yard is made easy by using our comprehensive directory. If you have a scrap car sitting around or if your trusty vehicle is ready for the junk yard then start your web search with us. We list many quality auto wrecking yards from across North America and the world. Auto salvage yards are an important part of the green recycling process and supporting your local eco-friendly junkyard is a great way to dispose of an old vehicle and do your part to keep the planet green. The Canadian program (Retire Your Ride) is very successful and everyone is talk­ing about junking of old vehicle these days. I think this is largely due to the hype that surrounded the CARS program, better known as "Cash for Clunkers." Why is My Junk Car Worth Money? Have you ever wondered why auto recyclers are willing to tow your old junk car away for free? Well the answer is simple, they want your junk car so they can recycle the used parts that are still quite valuable. It works out well a double win! When you are ready to get rid of your old junk car you should consider using a quality nation-wide service that has good business ethics and also cares about the planet. We only use eco-friendly recyclers in our North American wide network. 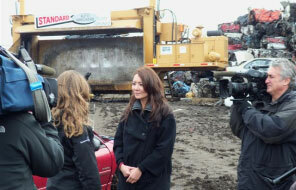 A new website is recently launched to help Canadians get rid of their old junk cars. Many times offering a high cash payout for the car to be recycled and towing is always free. Quick and easy for customers to use. Finding a final resting place for that old, faithful automobile is not always that easy. Do you have an old, rusted, junk car that is just taking up space on your property? Perhaps you have a wrecked car that you want to dispose of properly. When your vehicle reaches the end of its useful life it is time to send it over to the junk yard to be recycled. Find an eco-friendly auto recycler in your local area and you might even end up with some cash in your pocket.